With the “Expert Golf” score card, you can record the scores for up to four players and archive these score cards. The app also calculates your Stableford points fully-automatically. 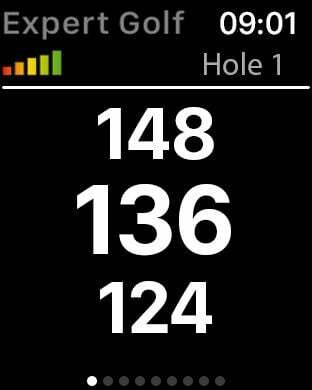 This is facilitated by a vast database containing the score card information and the ratings of the golf courses (unlike other apps with which the users have to create the score cards themselves). The database is updated and extended daily. An overview of the current list of courses can be found at courses.expertgolf.com. ▸ User-friendly and intuitive operation (a manual is superfluous). ▸ The first score card in the world that can be signed on the touchscreen. ▸ More precise data thanks to professional mapping. ▸ Support 365 days a year. ▸ No advertising pop-ups at all. ▸ Excellent customer ratings and top rankings in the App Store. ▸ Leading app for many years and improved with regular updates. Each year approximately 15% of golf courses are redesigned or newly built or the order of their holes is changed etc. This means that the database has to be constantly maintained and updated. Only with an annual fee concept will you be guaranteed access to up-to-date and comprehensive data that you can trust on a long-term basis. Providers that only charge a once-only payment for their app will sooner or later stop maintaining their data. If you are happy with our app we would be grateful if you would take a moment of your time to post a rating/ write a review in the App Store. If, for whatever reason, you are not happy with the app or have any questions about it please contact our support team at support@expertgolf.com.